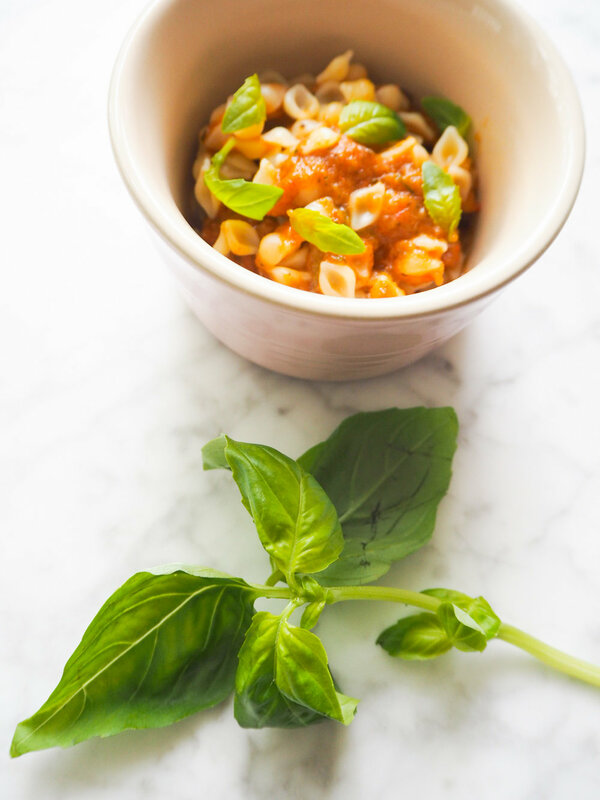 This lovely veggie packed pasta sauce, is incredibly versatile. Both my children (8 months and 4 years) love it. For my baby boy, I mix it through baby pasta shells and for my daughter I use it to top pizzas, roasted fish or as a dip for chicken strips. It really transforms so many recipes. This is the version I make which is baby friendly. It is packed full of goodness and freezes beautifully. This recipe does contain tomatoes, which can be acidic for some babies. So you can choose to omit these entirely, if trying for the first time. Or just add 1 of 2 tomatoes to reduce the ratio of tomatoes in the sauce. As always, our paediatric dietician Bianca Parau advises that you try each ingredient separately, so there is no reaction to any of the ingredients, before offering this dish. Remove from the oven and blend with a stick blender, adding a few tablespoons of boiled water to achieve a consistency you like.